This topic contains 14 replies, has 1 voice, and was last updated by gurusid 5 years, 6 months ago. 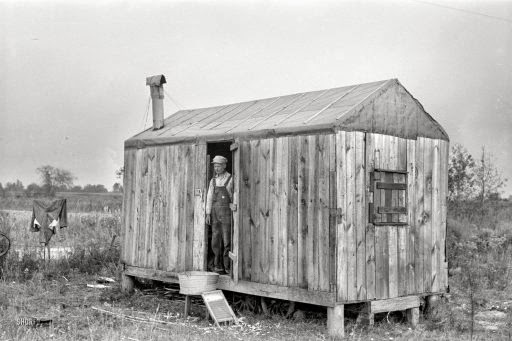 "Shack of day laborer near New Iberia"
UPDATED: It's always amusing to peruse the press and find stuff that just doesn't hold up. Not for a big analysis, just a chuckle, albeit with a serious undercurrent. I've explained a hundred times that the prize Bob Shiller was awarded on Monday is not a Nobel prize, but a cheap fake, and I've looked for the correct name for it, Notbel, NoNobel, Fauxbel, but that ground has been covered and Shiller got the thing and why dwell on the stupidity of it all indefinitely? Besides, just because the award is fake and economics is no more of a science than chocolate chip cookie baking and never will be, doesn't mean that Shiller never said anything useful. Or has he? Why don't we let the double clown act of Cameron and Osborne that – by the looks of it – tries to bring Britain to its knees, decide about that? A week ago in Gordon Gecko Moved To London, I wrote about the UK government's various blindingly bright ideas for its economy, like for instance "a new fiscal mandate that will require further welfare cuts to build an overall budget surplus by the end of the next parliament", with the 2013-14 budget deficit of £120 billion to fall to £43 billion in 2017-18. The money saved through the £77 billion in welfare cuts to the poor will be used to hand money to the corporate world to achieve the myopic pipedream of "100,000 more companies exporting and a doubling of our exports to £1 trillion by 2020", the latter being an exact copy of Obama's earlier goal for US exports, an equally unrealistic piece of cheap political yada yada. I try to use the term "perverse" sparingly, which is not easy, because so much in our economies has been perverted one way or another, but this is a really good example. Cameron says it's not fair that only rich kids can buy houses, but his Help-to-Buy scheme in fact makes houses more expensive, which means the not-so-rich will now need to go deeper into debt to buy the same house, if they can still afford it at all. With an average full-time salary of £26,500, the £600,000 properties are off limits to them. Those will go to [the] rich kids, who now can buy them at much more lucrative terms, like a £120,000 interest free loan (about as much as the poorer can spend on an entire house). So most of the booty will go to people who probably don't even need it, while the price jump the plan results in pushes the not-so-rich either off the market or deeper into debt than they would have been without it. That's what we call a bubble. And yes, we're only now in the later stages of the last housing bubble, so why insist on blowing another one? Well, obviously, because falling prices are a threat to the existing economical system, and it's so amazingly simple to declare that "this is not a bubble". Unfortunately for Cameron et al, Robert Shiller doesn't care one bit about their statement that "it isn't fair". And he was just awarded the Fauxbel, while they were not. So either they should call the guys who award the thing and insist they made a terrible mistake, and suggest they themselves should have been awarded it, since they, to judge from their policies, think they know better than Shiller, or alternatively they should call an immediate halt to Help-to-Buy and apologize to everyone who used the scheme to purchase a home, and not least of all to Robert Shiller. With prices still off of their all-time highs, many can't help but ask the brilliant Professor if now's the time to invest in housing. And for years, he has responded with more or less the same answer: housing is not a great investment. This was an idea that he pushed in his must-read book, Irrational Exuberance. Robert Shiller, the Yale economist who nailed the housing bubble before it burst, was on Bloomberg Television with Trish Regan and Adam Johnson on Wednesday afternoon to discuss the U.S. housing market. As usual, Shiller was reluctant to declare that home prices had bottomed. He explained that the housing market is a speculative one and that there's no telling which way prices would go tomorrow. He also explained that there wasn't much reason to believe that home prices would appreciate back to levels seen during the last cycle. Regan followed up with a question that got Shiller perked up. "Then why buy a home?" she asked. "People trap their savings in a home. They're running an opportunity cost of not having that money liquid to earn a better return in the market. Why do it?" "Absolutely!" Shiller exclaimed. "Housing traditionally is not viewed as a great investment. It takes maintenance, it depreciates, it goes out of style. All of those are problems. And there's technical progress in housing. So, new ones are better." For people who can't wrap their heads around this, Shiller offers an analogy. "If you think investing in housing is such a great idea, why not invest in cars?" he asked. "Buy a car, mothball it, and sell it in 20 years. Obviously not a good idea because people won't want our cars. It's the same with our houses. So, they're not really an investment vehicle." In case Shiller's message is still not clear: buying a home at a time when your government is artificially inflating housing prices is not a good idea. As a matter of fact, a house is almost never a good investment. It only seems to be one in the middle of a bubble, when prices rise enough to make people believe they will always keep rising (not a rational idea, and Shiller got his Notbel for pointing out markets are not rational, though why they were ever thought to be in the first place is beyond me). At any other time, if you need to go into debt to buy a home, it's not a good investment. Not my words, but Shiller's. And he's the man of the day. I would love to see Cameron and Osborne react to this, but I'm sure they'd avoid doing so like the plague with a toothache. Still, I can imagine them claiming that Shiller's an American, and the British housing market is different, there's more demand than supply, something along those lines. The reality is that it's never different "here", and it's never different "this time", other than for fleetingly short periods of time. As for young people in Britain, it's true that I at least partly treat this as a kind of a joke, but then, I see your entire government as a joke. Still, please don't fall for their schemes, they don't have your best interest at heart. Rent. Renting is not losing money, it's transferring the investment risk to the home owner, and that's huge in overpriced markets. Heed Shiller's words: Housing as an investment was a fad, and "I don't expect it to come back." Buy only if you don’t have to go into debt to do so. We've said it here at The Automatic Earth for years. Wait for prices to fall. They will, guaranteed. No matter how many rich Chinese and Russian "businessmen" (nudge nudge wink wink) Cameron invites into London on a red carpet to take over from those who were born there. One of three American economists who won the 2013 economics Nobel prize on Monday for research into market prices and asset bubbles expressed alarm at the rapid rise in global housing prices. In June this year, he pointed to a potential new housing bubble in some of America's largest cities. "It is up 12 percent in the last year. This is a very rapid price increase right now, and I believe that it is accelerated somewhat by the Fed's policy," he said. So, how far will rents fall, to make land lording unprofitable? The “it’s different this time” collapse of rents will certainly be a first in my lifetime and that of my parents. Or, as the worm turns on a 30 year dis-inflation cycle, what will it take to convince renters no one can save as fast as inflation robs their purchasing power, unless he is a nobel anointed member of academe, complete with six digit inflation adjusted salary and a pension to die for. Granted, it all looks stable and calm now, but when the dollar typhoon is unleashed, a fixed rate mortgage, especially at these absurdly low rates, will once again be a safe haven. The last place I want to be is in cash or equivalents when the grand reset takes place. My take on this house price uptick is, it is early realization of that age old phenom. House prices have had 5 years now to back up from an over shoot. Yellen is not an inflation hawk, she’s a Keynesian. The next print will devalue the buck at least 40%, and looking at food prices, it is well underway. A home could be had for around $36k about then. $650K today? A Million and a quarter in 10 years? Aside, I get it,,,Demolition,,,Nobel,,, Dine-O-Myte! Updated the article, added Shiller quotes from a Reuters interview. “The Grand Reset”? How do you envision that? Loans to landlords have reached a five-year high, with the Bank’s low rates pledge predicted to propel further growth. A series of modern day British slums have been described as “sheds with beds”. The illegal structures, some dangerous and cramped, are offered by landlords – often to Britain’s illegal immigrants. Many occupants send money back to their families in India, paying thousands of pounds to traffickers. But the economic downturn means work has dried up. How to dispose of a bad loan. I’m feeling anxious. I’m feeling sick to my stomach. People are getting lazy, sloppy. Somebody’s going to get hurt. Now listen to me. You want to be a part of this family? You want to play with the big boys? Watch and Learn. You make a bad loan. Boom! It’s done. Move-on. Don’t sit on that paper. You get 3 billing cycles before it starts to putrefy and stink. And then what? You plan to let that paper moulder, and the ink run all over the trunk of my Cadillac. No way. That’s how mistakes are made my friend. Step one, you get me a wood chipper. I’m talking Fargo here. I want that loan chopped up nice and fine. Unidentifiable. Step two, you find me some nice car loans, respectable types – you know what I’m talking about. Assitant branch manager for municipal accounting and his nice new Hyundai Sonata. Boom! Into the chipper with the rest of that scum. Mix it up good. Step three, let me introduce you to my nice political friend here. He has in mind the best interests of our fine elderly blue collar chumps. And, by the way, he has a certain deviant interest in pregnant marsupials and finely chipped untraceable high-yielding paper. What can I say? The man knows his mulch. He’s going to take that chipped paper, and spread it all around the flower beds of our fine local retirement communities. And from all those deceptions, back room deals, cheating, and corrupt money laundering, we’re going to grow ourselves a nice garden of roses. And when they bloom in the spring, we’re going to gather round, shake hands, and breathe deeply to appreciate the finer subtle things of life. And if anybody asks any questions, Boom! You make them a payday loan and into chipper they go. We’re family here. We look out for one another. While I have been a fan of Robert Schiller, this critique doesn’t go far enough. In the first place, since we reached peak employment in about 1999, the chances of having a job that pays enough to clear a mortgage in any acceptable time frame is increasingly slim, but at least having a house gives you a roof over your head while you meander through the foreclosure process. On the other hand, if you are a renter, no job or not enough income means instant acquaintance with the streets. But the real issue is that there are no “investments” left. An investment is inherently rent seeking and depends absolutely on enough other people being prepared to take on enough debt to keep the economy “growing” so that whatever it is you “invested” in will fetch more in real terms at some future time than it does now. Without growth, ALL of those strategies and asset classes and whatever “investment” lingo you want to use are worthless and, if there is debt involved, as AE knows full well, have negative wealth effects. From here on folks, we WORK for our meals and out clothes and our roof and we probably grow and make and build them ourselves out of whatever we can cobble together. Investments are on their way to becoming quaint, almost mythological, blobs in the history book. All you have to do is look at one simple FRED timeseries (provided below) and you see the reason for the housing price move since 1972: money loaned into existence by willing borrowers. You just have to ask yourself a question: do we imagine this chart continues up at its 2000-2008 rate into infinity? If so, then yes by all means, Real Estate will perform just as it did in the 70s and during the 2000 bubble years. But wait. Currently aggregate RE debt has been declining for the past 5 years. First time in the history of the series. I wonder why that is? Without the fuel provided by a constant inflow of ever-increasing debt-based money, any boom in housing is doomed to be short-lived. Once the hedge fund money runs out, we get another move down. I have to say, I am continually surprised by people’s complete unwillingness to look at data. They seemingly prefer to rely on 10, or 30 or 40 year old stories about how something went way back when, and then project that same storyline infinitely into the future. Cycles. Things move in cycles – and sometimes, supercycles. Likely they do this because of this very phenomenon, where otherwise-intelligent people simply project recent past performance infinitely into the future. It really is all there in the data. You just have to care to look, with an open mind. Apparently, that last bit runs counter to basic human psychology. However, the other thing to consider is the distribution. The overall figures might even look acceptable (they don’t) but when the top 0.1% owns 75% of everything and the bottom 50% have almost nothing, you have a recipe for revolution. Looks scary and all, them graphs, but I dare you to explain both the correlation AND the consequences we can derive from on the one hand those graphs and on the other the population one, which will look pretty similar. 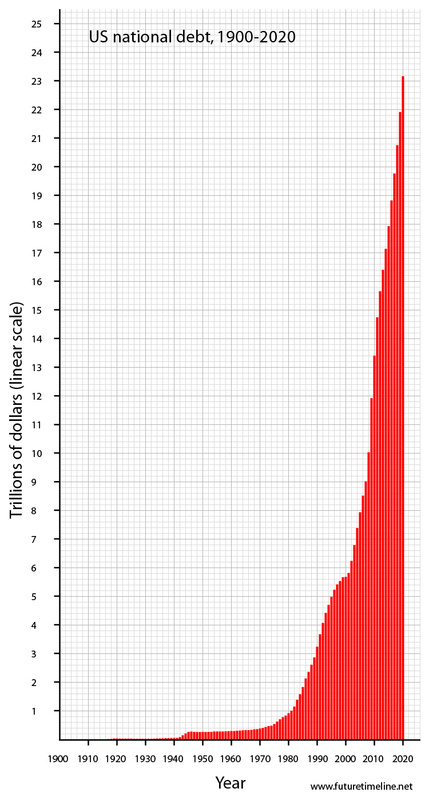 If QE is mostly the buying of Mortgage Backed Securities; what happens when they have bought all of these. Can they just say that they are buying them, when in fact they aren’t. Also when this is done- ie there are no more to buy- what do they do next? At some point isn’t the treasury going to have to step in and print money? I know Nicole has always preached deflation but it is hard to see that in the U.S with its currency of last resort. By the way does Geitner still work in Washington? I know he is just a figure head but what the hell is he doing these days? But my point is that the exponential growth in loan money has stopped since the bubble pop. So – might it also be true that the housing price appreciation model that depended on said exponential growth in loan money, might stop too? All right, that’s too scary. Rather than gore that sacred ox (to mix a metaphor), let’s just say that non-growing real estate loan money puts at risk the standard thinking that houses always go up. We know monetary inflation comes from expanding credit. What must be deduce from contracting credit, then? And given RE credit is contracting, what must we deduce from that? That housing prices always go up? …I dare you to explain both the correlation AND the consequences we can derive from on the one hand those graphs and on the other the population one, which will look pretty similar. Not that I’m an economist 😆 or would even want to pretend to be one, but short answer to both is that they look suspiciously exponential and we all know where that ends. 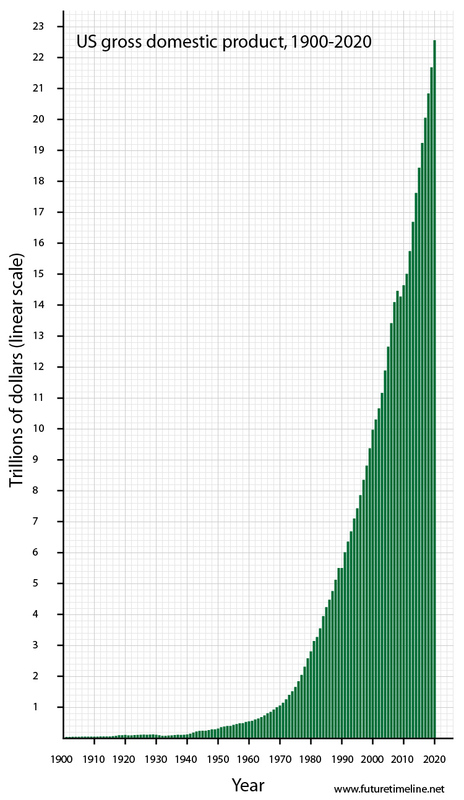 However referencing the 1970’s (as that was what Dave was doing), the US debt chart goes from 400 billion to over 23trillion that’s about a 60 fold increase. 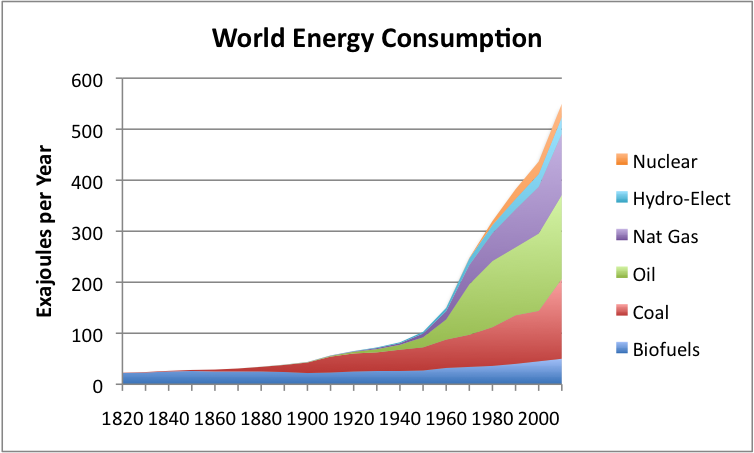 Population has only gone up about 2 fold (3.5 billion around 1970), the same interestingly for energy consumption. 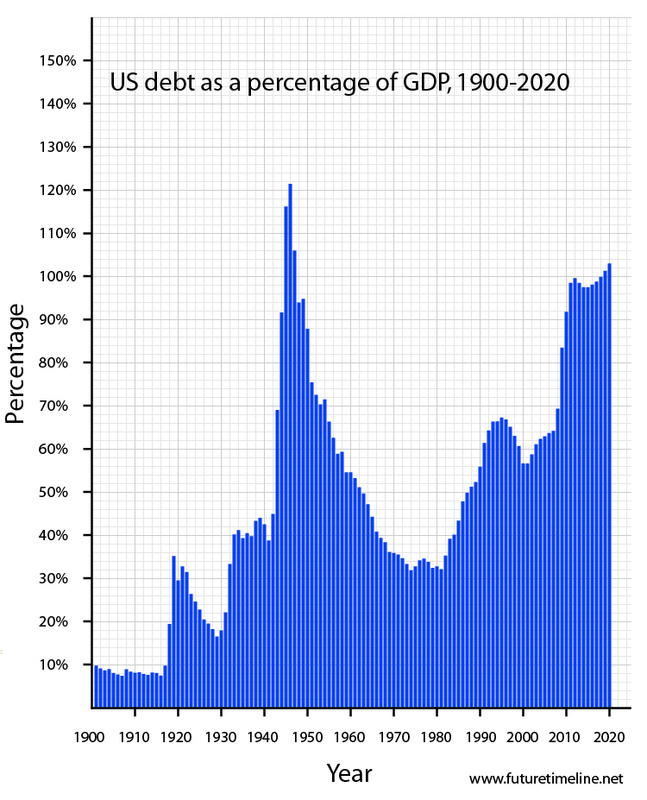 Given that debt to GDP now stands at about 3 times what it was in the 70s you could say ‘real’ US debt has increased by a factor of 20 times. https://www.measuringworth.com/usgdp/ Select 1970-2009, then plot ‘real’ GDP. Given that ‘price’ inflation has been about 1200% since 1970 and US debt has gone up over 5000% if we take the 400billion to 23trillion figures, or a more inflation adjusted figure of 1900% for a 20 fold increase relative to GDP! And this is only the start of it (or the end) as being exponential, the slope looks likely to only increase – Al Bartlet’s ‘doubling’. So only at one minute to midnight do we find that another doubling will fill the fish pond or in this case crash the economy/ecosphere. Even if we found another planet it would take – metaphorically – only another minute to fill that one as well, as the ‘doubling time’ is only a minute. Thus the ‘really real’ engine of growth – energy itself, though having increased recently along with population is also getting a lot more expensive as the costs of extracting harder to get and lower grade reserves starts to impinge on that ‘doubling rate’. 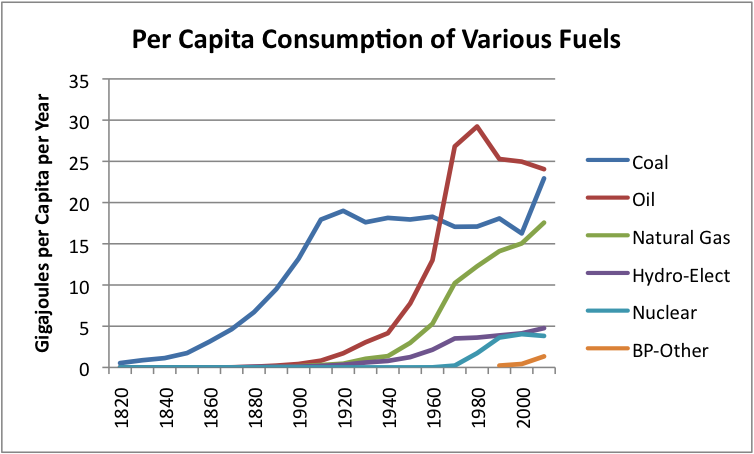 In all the excitement of the last two centuries of economic growth, we seem to have plum forgotten that these energy resources are limited. So you have to ask yourself, do you think they will double again in the next twenty or so years? Well, do you feel lucky, [strike]punk[/strike] people ? Sorry out of sync here – I was chomping on a reply to Ilargi – see above. Cycles. Things move in cycles – and sometimes, supercycles.